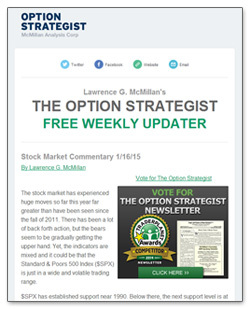 The Option Strategist Weekly Updater is McMillan Analysis Corp.'s free email newsletter containing weekly market analysis and information on important website happenings and events featuring Lawrence G. McMillan. Stock Market Commentary - McMillan's stock market analysis based on various technical indicators including put-call ratios, breadth, sentiment, price action, momentum, volatility and volatility derivatives. Weekly Blog Roundup - An email each Monday featuring all of the articles from the OptionStrategist.com blog. Calendar of Upcoming Events - News about upcoming Option Strategist events including McMillan's seminars, appearances and speaking engagements. Special Deals - Discounts, specials and coupons on select products and services from McMillan Analysis and our affiliates. Sign up today and receive McMillan's invaluable market insights each Friday for free! This regular email goes out only to those select visitors who have opted to receive it and is sent weekly. All email addresses are kept strictly confidential. We do not sell or trade our email list. We will however send out the periodic advertisement for our various products and services. Content provided by Lawrence G. McMillan, OptionStrategist.com, and McMillan Analysis Corp. is featured at the following financial outlets.